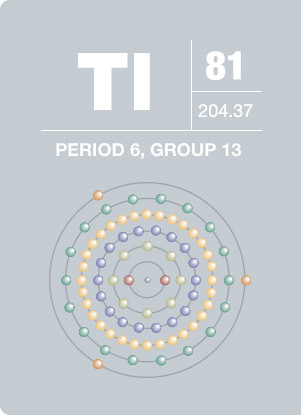 Thallium was discovered spectroscopically in 1861 by Sir William Crookes. Very soft and malleable, thallium can be cut with a knife at room temperature. This element exhibits a metallic luster when freshly exposed to air, but soon becomes bluish-grey, resembling tin or lead. The element and its compounds are toxic and must be handled carefully. Thallium is believed to cause cancer. Thallium-doped silicon is a semiconductor material used in infrared detectors. Thallium bromide-iodide crystals may also be found in infrared detectors. Thallium is used as a rat and ant killer. It was originally used in treating ringworm and other skin infections.